Madeleine McCann's parents insist they "will never give up" on her, despite the inquiry into her disappearance being shelved by Portuguese officials. Kate and Gerry McCann and a third British national, Robert Murat, are also now no longer formal suspects. The McCanns, of Rothley, Leics, said it had been "utterly despairing" to be suspects in the case, but said: "Our priority has always been the search." Mr Murat said he was "very relieved" at the decision. Madeleine disappeared from her family's holiday apartment in Praia da Luz, in the Algarve, on 3 May 2007, just days before her fourth birthday. The McCanns, both 39, and Mr Murat, 34, all strongly denied having had any involvement in what happened to her. On Monday, Portugal's attorney-general, Fernando Jose Pinto Monteiro, lifted their suspect - or arguido - status, saying the 14-month investigation had uncovered no evidence of a crime by any of them. He said the case could be reopened if new evidence emerged from any "serious, pertinent and authoritative source". Later Mrs McCann told a news conference in Rothley that while they welcomed the day's announcement, there was "no cause for celebration". "It's hard to describe how utterly despairing it was to be named arguido and subsequently portrayed in the media as suspects in our own daughter's abduction and worse," she said. "Equally, it has been devastating to witness the effect this status has had on the search for Madeleine. "We look forward to scrutinising the police files to see what has actually been done and more importantly what can still be done as we leave no stone unturned in the search for our little girl." Mrs McCann thanked everyone who had supported the family, adding: "We can assure you we will never give up on Madeleine." Mr McCann said the couple had no immediate plans to return to Portugal. When asked whether they would take legal action against the Portuguese authorities, he said the search for Madeleine remained the priority and "anything else is secondary and will be considered in due course". The McCanns' spokesman Clarence Mitchell said their lawyers would be able to examine the police case files by the end of the week. The couple hope information within them could help their own private investigators continue the search for their daughter. 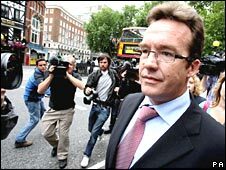 Mr Mitchell said the McCanns' suspect status had been a "complete distraction" and "entirely wrongly imposed". He said the couple would now take time to "digest" the attorney-general's decision and "the implications of what it means for them, for their reputations and for the wider search for Madeleine". In March, Mr and Mrs McCann received a libel settlement of £550,000, which went to the fund set up to find her, and an apology from Express Newspapers for suggesting they were responsible for her death. And last week Mr Murat received a £600,000 settlement and apology after a libel action over allegations about him in 11 UK newspapers. Mr Murat, who lives with his mother in Praia da Luz, is currently in the UK with family and friends. He told BBC News: "I think it will take a couple more days to sink in and become reality. "It's been completely devastating. It's a case of rebuilding from now. My immediate plans now are to spend some time with my family." He also said he would like to know why he had been made an arguido.